In today’s age, Driver’s License has become essential in everyone’s part of life. It not only acts as a Driving License but also acts as an Identity proof. A driving license is an official document that states that a person can operate or is eligible to drive any type of motorized vehicles such as motorcycle, car, bike, truck or a bus on a public roadway. According to the Motor Vehicles Act in 1988 in India, no person can drive a vehicle in a public place until and unless he/she holds a valid Driving License. In India, each state has its own process, test and different criteria to apply for a Driving License. To apply for a Driving License there are different rules and regulations to follow. In Andhra Pradesh, the process of obtaining a Driving License has been simplified and the process has been made more transparent. The individuals residing in Andhra Pradesh can get a Driving License from the Motor Vehicle Inspector’s Office or at the Regional Transport Office that has the jurisdiction over the Residential area of the applicant. Driving License for the Motor Vehicles Without Gear: This type of Driving License is issued to those individuals who drive motor vehicles without gear such as the scooters and mopeds. The age of eligibility to ride this type of vehicle is 16 years. Driving License For A Light Motor Vehicle: This driving license is issued to those individuals who drive lightweight vehicles like cars and bikes. To obtain a driving license for this criteria the candidate must be 18 years. Driving License For Transport Vehicles: The individuals who wish to drive vehicles such as taxis, private service vehicles, trucks, lorries etc can apply for this Driving License. The eligibility to obtain this Driving License is 20 years. The individuals can apply for a Driving License online by using the Meeseva Facility. The Meeseva facility provides registration for Driving License by applying a registration form which can be downloaded and submitted at the nearest RTO Office. 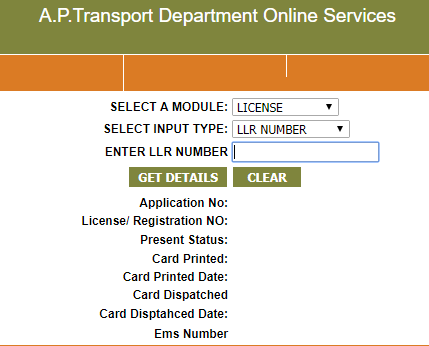 Below is the process for applying for a Driving License online in Andhra Pradesh. Visit the Meeseva Web Portal and download the application form for Driving License. Now enter the required information which includes the Aadhaar card number, name of the applicant, father’s name, contact number, address, survey number, and ration card number. Fill in the application form completely and submit the form to the nearest Regional Transport Office with photograph copies. If you are not having a Learner’s License, then you can book a slot for Learner’s License Test. You will just have to provide the district and the test center where you wish to apply. Now, click on the submit button and get a copy of the application. Go to the test center on the allotted date with a printout of the application form and the other required documents. The Offline procedure of applying a Driving License is quite straightforward and simple. The procedure for offline is as follows. Get the Form 4 here It is the application form for a license to drive a motor vehicle which is available at Andhra Pradesh Transport Website. The individuals can also visit the nearest Regional Transport Office to get the form. A learner’s license must be produced by an individual. If required, the individual must also submit the medical certificate duly signed by an authorized doctor along with a declaration. The required documents must be submitted along with the Application Form. If an individual is applying for a Transport Vehicle, then he should apply for Form 5. Then the RTO Office will allow a slot for the applicant to undergo a test, where the individual must pass the test so as to obtain a Permanent Driving License. Valid documents of the vehicle. Duly filled an application form which can be obtained from the Andhra Pradesh Transport Organization. Medical Certificate in Form 1A and 1 that is issued by any Certified Government Doctor. (if applicable). You may require a couple of additional documents on the basis of your application form. Do enquire with the RTO office before submitting the application form. now, enter the “License” as the modulation type. You can also provide the License Number or Application Number whichever is suitable. Enter the Learner’s License Number (LLR), application number or the License Number and click “Get Details” to know more about the status of your Application. If the details that you have entered is correct, then the portal will display the current status of the application form which includes the EMS Number, Date of Driving License Card Print etc. For checking the status offline, the applicants can visit the nearest Regional Transport Office in Andhra Pradesh. They will give you the complete details of the Driving License including the Learner’s License Number, Application Number and License number to get updates regarding the Driving License Application Status. For the individuals who wish to change the name, address or make relevant corrections in their Driving License copy, can follow this procedure. The request for the correction in the Driving License can be done by visiting the nearest Regional Transport Office, which has issued your Driving License. Like for an example: if you have obtained your Driving License in Delhi then you cannot make changes in the Regional Transport Office of Hyderabad. For changing the name in the Driving License, you must provide the Marriage Certificate and other relevant documents. For the change of address, copies of proof of residence or the place of business must be produced. The original documents may be asked for verification purpose. The applicant can be asked for providing a copy of Driving License. An application of the change in information can also be made on a plain paper by affixing a non-judicial court fee stamp to the licensing authority. The application is then submitted to the concerned RTO and get it approved by the Regional Transport Officer. After the approval of the application, a receipt is offered which can be produced as a temporary driving license proof. The new Updated Driving License is then sent via post to the mentioned address. Here the applicant has to appear a driving test in presence of a Motor Vehicle Inspector (MVI) and must pass the test to obtain the Permanent Driving License. The person appearing the test must hold a valid Learner’s License for a period of minimum 30 days. If the applicant does not pass the Driving License Test, then he may be permitted to apply for a re-test after a period of seven days. An interview is also held on the questions regarding the signs and road signals and safety. Andhra Pradesh offers four different tracks for taking the Driving License Test- Nagole Driving Test Facility, Kondapur Driving Test Facility, Gannavaram Nagole Driving Test Facility, Ampapuram Nagole Heavy Vehicle Driving Test Facility. Applicants can choose their nearest test center. The applicants can book a slot for Driving License Test online. They can choose the time as well as the test location. The applicants will be then asked to drive a motor vehicle in presence of the Motor Vehicle Inspector who will then assess the driving skills and decides whether the candidate is eligible for the license or not. After the driving test, a small interview is held where the candidate is asked about the different road signals and safety measures. The candidate must pass this section to obtain the driving license card. If in case, the candidate does not pass the test, then he will have to wait for a week to re-apply for the test. Fill in Form 9 here, this application form is meant for the renewal of the Driving License. Submit the form, in the nearest RTO which issued the driving license or the licensing authority having jurisdiction over the residential area of the applicant. Along with the application form, also submit the fee as mentioned in Rule 32 in the CMV Rules. Include three passport sized photographs along with the application form if the renewal is mentioned in Form 6. The original driving license must also be submitted along with the other required documents. Medical certificates as mentioned in Form 1A, and should be presented along with the declaration of Form 1. The RTO officer will then validate and approve the application for the Driving License renewal and the new driving license is then sent to the residence of the applicant via post. How To Apply For Duplicate Driving License? Completely fill the LLD Form here and submit to the nearest RTO where the Driving License was obtained or where it was last renewed. Along with the LLD form, submit three copies of passport sized photographs and application fee as mentioned in APMV Rulebook. If the request for the Duplicate driving license is already made in Form 7, then the applicant has to pay a nominal fee of Rs 40. The applicant must also present the Original copy of the Driving License while applying for the Duplicate copy. Completely fill in the IDP Form here, from where the Driving License as obtained or last renewed. Original copies of the Driving License for Verification Purpose. A nominal fee of Rs 200 is paid by the applicant while submitting the IDP Form. The application is then verified and approved by the RTO Officer and the Internation Driving License is sent to residents of the applicant. Hence, these are the various ways to apply for a Driving License and the process and documents to submit. The Driving License of the applicant will be sent via Post on the address mentioned in the Application Form. The Ministry of Road and Transportation have developed and facilitated computerization of more than 1000 Regional Transport Offices (RTO) across the country. The Regional Transport Office issues the Registration Certificate and Driving License that are valid across the country. The Driving License is one of the most important documents which is recognized by the Government of India. The Driving License not only serves as the Certification of Driving Ability but also serves as a valid Identity Proof. If you want to apply for a Driving License online, then you need to visit the Official website of the Regional Transport Office (RTO). You can download the form from the website. Then submit the form along with the documents that are required during the process. Firstly, a learning license is issued if you pass the first test at the RTO successfully. Then after, a month later you have to apply for another test and clear that test too which means that if you clear both the tests successfully, Driving License will be issued. In this article, we are going to provide you with a detailed guide on how to apply for a new Driving License online. Then select one from the option and then click on continue. Then you will proceed to the Applicant Details. In the applicant details section, fill in the required details. If your place of birth is outside India then you have to mention the month and the year you have migrated to India. After filling all the details, now click on continue to proceed to the next step. In the next step, enter the details of your address. Then enter the class of the vehicles. The class of the vehicles denotes the specific feature or the quality of your motor vehicle. After you are done filling the application form, now accept the declaration form and submit along with the documents. The next section of the application form that denotes the type of vehicle that the applicant is seeking for a license to drive. The applicant can list up to 19 vehicle types for a license in one single form. You also have to mention the type of the License you are applying for. You should also mention the Registration Certificate. In this section, the applicant has to enter all the enclosures that he/she is submitting along with the document. The enclosure documents that are submitted are the proof of address, identity, and age. The Learner’s License or the Driving License is issued to the applicant, along with the details such as the registering of the RTO and the Date of Issue. This section consists of the declarations that say that the applicant has submitted all the necessary documents and enclosures like the medical certificate, license, documents of proof etc. This section is associated with those who are applying for the Learner’s License and contains a document providing the parent/ guardian’s permission to apply for the Learner’s License. This section is to be signed in the presence of the Licensing Authority by the parent/guardian. After the completion of the form, you can click on the “Submit” button at the end of the form. After the submission, an auto-generated Web Application Number is generated on the screen. This number can be used for the future reference and can also be used to check the status of the application form. Why should one apply for a Driving License Online? It is necessary to apply for a Driving License online because it makes the application process more convenient and takes less time to go through the entire process. You can download the application form or submit it along with the necessary documents. Once this process is completed, you need to appear the written exam along with the interview. To obtain a License, you need to clear these batches of test successfully. Note: The online registration for the Learner’s License is only valid for the vehicles which are used for the personal purpose only. This is not applicable for the Commercial Purpose Vehicles. In a single application form, the applicant can apply for LL for more than one category of vehicle. The preliminary test is the same for all the vehicles irrespective of the category of the vehicle for which LL is applied. To apply for a Driving License, the applicant has to first apply for a Learner’s License. The applicant has to satisfy the following conditions to apply for a Learner’s License. The applicant’s age must be over 16 years for two-wheeler vehicle and 18 years for four-wheeler vehicle. The learner’s license holder can apply for a driving license 30 days after the issue of their Learner’s License. Learner’s License holders have to apply for a driving license within 180 days (6 months) of their Learner’s License being issued. Proof of Address- Passport/ Ration Card / Voter ID / Life Insurance Policy/ Utility Bills like the Telephone bill, gas bill etc. / State or Central issued pay slip. You can submit any one of them. Proof of Age: you can submit any one of the mentioned: PAN Card, School Matriculation Certificate / Voter ID / Passport and Birth Certificate. All the documents pertaining to the vehicle to be used for the driving test. The applicants who wish apply for a Learner’s License can apply and submit the application form online. You can also book your driving test appointment. To apply online, the applicants can visit their state/Union Territory’s Regional Transport Authority Website and submit their application. They can also visit the Sarathi website which is managed by the Ministry of Road Transport and Highways. Voter ID card – Affidavit was sworn before a Public Notary or a Judicial Magistrate. Booking a test slot for a Learner’s License can be done online through the Sarathi website. The applicants who have submitted their application will receive notifications for slot book. All you have to do is go to the website and book the slots. The applicants who belong to this State or Union Territory can visit the website of Regional Transport Authority in their State and book a slot. Recheck the form once before the submission of the application. Doing this will help you to prevent the errors and mistakes. Do not forget to take the original documents when you are going for the driving test. The Learner’s License is valid only for six months. Do not submit wrong or fraud documents. Doing this can charge a penalty. Do not drive and ride without a valid license. If in case you are a Learner’s License Holder then do not drive without a License Holder. This can disqualify you from obtaining the Driving License. To get the details of the status and get current updates of the application form, send an SMS to 8790499899. Please include a “-“ in between the State Code and the RTO Code for the Driving License Status. Driving License Rajasthan: Driving License is an official document issued by the Regional Transport Office (RTO). Holding this document permits an individual to drive specific categories of vehicles based on his/her requirements. This document is issued to an individual, once the applicant passes the required test conducted by officials from RTO in Rajasthan. Once the applicants pass the test and hold the license, they are required to keep the license at all times and will have to produce it whenever a law official asks for it as this works as a proof of the candidate’s eligibility to operate a motor vehicle. In any part of the country, the applicants are required to procure a learner’s license. Any applicant above the age of 18 years is eligible for a learner’s license which is valid for 6 months. And holders of this license can only drive gearless vehicles with a capacity of 50 CC. Also, the applicants are required to provide written consent from parents and guardians. And within 180 days, the candidates can apply for a driving license. The Rajasthan Motor Vehicle department in Rajasthan has numerous Regional Transport Offices or RTO and staff throughout the state. This department is headed by the Transport Commissioner. And some of the responsibilities of this department are issuing driving licenses and permits, registration of motor vehicle, enforcing all regulations of the Motor Vehicle Act. If a customer applies for the Driving License Rajasthan, they can do it online or through RTO office. Procure form 4 and fill in the form by providing required details such as proof of age, proof of address, and so on. Applicants above the age of 50 will have to provide medical clearance through Form 1A. And in order to obtain a license, candidates are required to drive the vehicle that they wish to procure a license for as per the instructions of the RTO, the RTO officers will be present at the test. Fill the Form 4 (click to download) and submit it. Proof of residence such as Voter’s ID, Passport, Life Insurance Policy. Pay slip issued by the State Government, Central Government. Proof of age such as birth certificate, school certificate, and passport. Aadhaar has been interlinked with economy by first linking it with subsidies and then gradually making it mandatory for performing almost everything from bank transactions to filing your taxes. The reach of Aadhaar has gone far beyond its initial purpose of establishing the identity of its holder. Hence it has gained a lot of significance. However, people often find it difficult to link it with other important official documents such as Driving License. In this article, we will discuss the method to link Aadhaar with your Driving License online in four simple steps. Also note that Driving License are issued by State Road Transport, hence the process may vary between states. However, the method to link the two documents online remains pretty much the same. Online is the most convenient method of completing the procedure as you are not required to step out of the house, you can simply complete the task from the comfort of your house. Select the “Aadhaar Number Entry” on the home page then select “Search Element” as Driving License and then enter your DL number and click on the “Get Details” icon. You will see address and other such details of your DL. Click on “Submit” button. After that you will receive an OTP on your registered mobile number. And enter the OTP to confirm the changes. After that you will receive a confirmation message on your registered mobile number after the state road transport office verify and confirm the addition of Aadhaar number to your driving license. As we all know how Aadhaar has been made mandatory for almost all the official documents. Hence, to avoid any future inconvenience you should complete the linkage in given time. Government has made Aadhaar mandatory with driving license in order to help identify fake license holder. And this would help, maintaining smoothness in proceedings at state transport department. On 15th September, Union Minister Ravi Shankar Prasad announces that soon Aadhaar will be linked to one’s driver’s license. Center is making the linkage of Aadhaar card and driver’s license so as to curb people from having multiple driving licenses for a single man. Nitin Gadkari is Minister for Road Transport & Highways, Shipping and Water Resources, River Development & Ganga Rejuvenation in the Government of India. At present, many people tend to use multiple licenses. So if one license is confiscated, they can use another one. As a result, these multiple license generates fake identity. Hence, the solution to this menace is to link Aadhaar to driving license. This announcement comes immediately after the Government plans to link Aadhaar with Mobile SIM cards, where all the SIM cards will be deactivated in case of not linked with Aadhaar by February 2018. He also says that the linkage between PAN card and Aadhaar has been done to prevent money laundering. Sequentially Government is making it compulsory to link Aadhaar with almost every important document like PAN card, Bank accounts, financial transactions and welfare schemes. And lack of the Aadhaar card leads to denial of services. Hence, petition has been filed against this flagship program by the Government, as it violates the privacy rights of an individual. To register for Aadhaar UIDAI (Unique Identification Authority of India) collects all the demographic as well as biometric information such as Fingerprints and Iris Scans, which in case falls into wrong hands will be an invasion of privacy. Where Supreme Court declares that “Right to Privacy” is a fundamental right guaranteed under article 21 of the Indian Constitution. This verdict will definitely have an impact on Aadhaar card. However, Supreme Court did not say anything categorically on biometrics for Aadhaar. How to link Aadhaar with PAN Card. How to link Aadhaa with SIM Cards. How to link Aadhaar with Bank Accounts. How to link Aadhaar with Voter Id Card.